Mail Online has hit out at a US media start-up which ranks news websites for trust and credibility after it claimed the UK’s most-visited news site failed to uphold “basic standards of accuracy and accountability”. New York-based Newsguard has created a free extension for Google’s Chrome and Microsoft’s Edge browsers that hands out “green” and “red” ratings to news websites based on their trustworthiness. Its team of analysts handed Mail Online a red rating, the same as it gave to Kremlin-backed news websites RT (formerly Russia Today) and Sputnik. Newsguard claimed it had not yet heard from Mail Online, which is part of Daily Mail and Mail on Sunday publisher DMGT, when contacted. 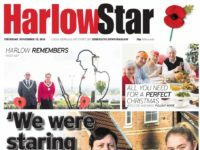 Joint-chief executive Steven Brill told Press Gazette: “We always call any news or information site before we publish a rating if even one of the boxes has a red ‘x’ in it, or might have a red ‘x’ in it. “In the case of the Daily Mail, I know we emailed them two or three times and [vice president of business development] Anna-Sophie [Harling] got someone on the phone in the newsroom and started asking questions, and the person refused to identify himself and hung up. Newsguard is now included as an opt-in extension on Microsoft Edge’s mobile web app. Microsoft began work with the company in August last year as part of the tech giant’s Defending Democracy Program. The leadership and analyst team behind the Newsguard ratings includes alumnus from The Week, the Wall Street Journal and the Associated Press. Exec editor James Warren is a former Chicago Tribune managing editor. In an outline of its ratings system, Newsguard said news websites are given a green rating if they “are trying to communicate news, information, and opinion that they believe is accurate” and keep to practices that meet “basic standards of accuracy and accountability”. All websites are rated from a scale of 0 to 100 points, with 60 points being the threshold dividing sources between red and green ratings. Each of the nine factors is weighted differently, with reporting true and accurate stories gaining the most points at 22 and providing information on “content creators”, such as journalist bios, the least at 5 points. Newsguard details how each news outlet has performed against each of these factors in a “nutrition label”. The Mail Online “nutrition label” said the website failed to meet the start-up’s standards across six factors, including avoiding deceptive headlines and handling the difference between news and opinion responsibly. It also met fewer of the Newsguard factors for trustworthiness than right-wing news website Breitbart and the Russian-backed RT, which carried an interview with the two Novichok poisoning prime suspects. It fared better than Russian state-owned news agency Sputnik, which was only approved on one factor: clearly labelling advertising. Mail Online is a member of press watchdog the Independent Press Standards Organisation, which regulates the vast majority of newspapers and magazines in the UK. Newsguard claims IPSO has mediated or upheld 19 breaches of the Editors’ Code of Practice against Mail Online for the year to December 2018 (although not all 2018 complaints have been listed by IPSO). 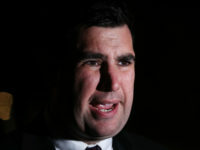 Of these, five were upheld as code breaches, four of which were accuracy complaints. Mail Online publishes some 1,500 stories per day, which is well over half-a-million per year. It has 12m average daily unique browsers, according to circulation auditor ABC. Brill said Newsguard is set for a UK launch by the end of April and is building a team to deal with UK publication ratings. He said Newsguard had rated the 2,000 most read news and information websites in the US and that UK publications rated so far happened to fall into that bracket. Brill also acknowledged that the Mail Online nutrition label was written for an American audience. 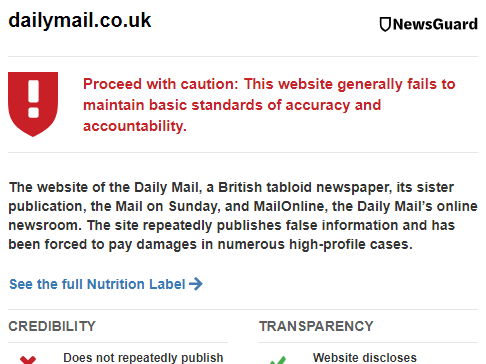 An editor’s note on the Mail Online “nutrition label” said Mail Online does regularly correct and clarify errors following a conversation between Newsguard and IPSO last year. Daily Star: Website is unrated and no notification suggests it is being rated. Metro: Website is unrated and no notification suggests it is being rated. ITV News: Website is unrated and no notification suggests it is being rated. The Canary: Website is unrated and no notification suggests it is being rated.